Secure your event venue with durable and reliable ID badging for staff, presenters, talent, and visitors. As an event manager, your first concern is security. That's why you need to partner with the leading event management security provider Idesco. Trade shows. Concerts. Sporting events. Conferences. There are as many venues to cover as there are event badging solutions from which to choose. You have options for your event badges. Design custom ID solutions. Do you need basic IDs with name and photo for your visitors, or access control badges to secure your venue? You can find the right large format card printer solution to meet your needs. Create oversized ID badges. Oversized photo IDs give you instant visual identification of who has the right credentials and access to restricted areas. And you can print these event badges on demand at your venue. Order preprinted cards. Get impressive, preprinted cards you can customize on site with name and photo ID. This can simplify your registration process by requiring less of the card to be printed on demand. Rent event badging printers. Don't have an oversized ID badge printer? No worries; you can rent one from Idesco. You get a solution fully customized to your event including printers, supplies, and cards. You also get our help before, during, and after your event. Make your attendees, staff, and visitors stand out from the crowd with high-quality oversized ID badges. 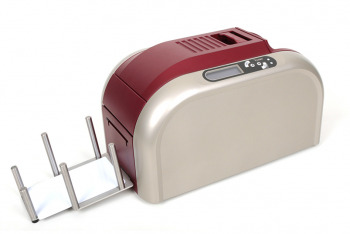 Idesco offers a full line of ID card printers for all your event needs. You can add a picture, logo, or text to your oversized event badges, and print in sharp, vivid colors. Issuing durable event credentials has never been easier. Get proven service and support to ensure spectacular events. With Idesco, you get vast experience that has secured some of the most prestigious events in the world. Don't trust your event to just anyone. with an event security expert. The XXL 2.0 card printer for oversized badges is the professional solution to issue high-quality badges for all your events. Robust and easy to use, the XXL 2.0 printer features a Plug & Play driver for Windows and Mac, standard USB, and a convenient display. The XXL 2.0 ID card printer can print up to 180 full cards per hour in color, and up to 1,400 cards per hour in monochrome. The printer can personalize preprinted cards of 2 different sizes: 3.46" x 4.88" and 3.46" x 5.51".